Enjoy our beautiful private dining room for your next function. Let one of our professional planners help with your next social get-together, dinner meeting, or rehearsal dinner. This elegantly appointed private room seats up to 50 people. Parties of 12 or fewer can order off of our al a cart menu. Chef has prepared 3 private dining menus for parties of 13 or more. 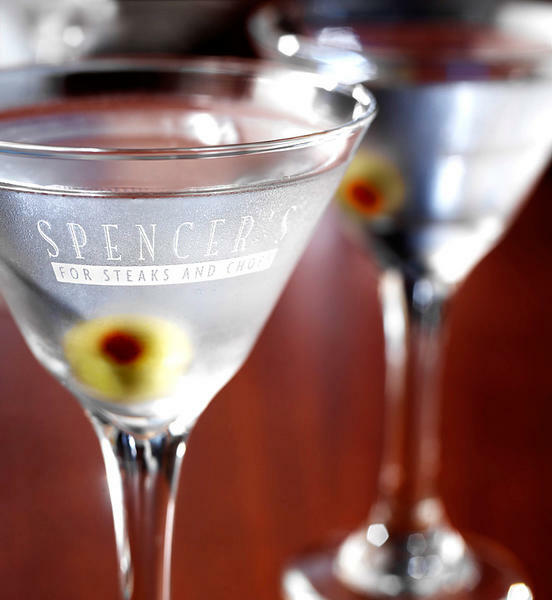 Spencer's for Steaks and Chops of Omaha offers prime steaks, lamb chops, pork chops, veal chops, fresh seafood, pastas, as well as an array of fresh, homemade desserts. We invite you to experience "Prime" beef pure and simple. Try something new every weekend! Fridays and Saturdays, enjoy a Prix-Fixe Menu created by Chef Wheeler. These off menu creations showcase the talent and creativity from our amazing culinary staff. Spencer's is so much more than just great steaks. If you prefer the sea to the plains, try one of our jet fresh seafood entrees. We feature succulent Australian Lobster, fresh pan seared Scottish Salmon, jumbo New Bedford Sea Scallops, fresh Prince William Sound Mussels and Ahi Tuna seared rare. Chef Glenn Wheeler is a true legend in the Omaha culinary scene. He has been the Executive Chef at Spencer’s since 2010 and has been the single most important piece of our success. Glenn is from Michigan City, Indiana and brings a lot of his hometown inspiration to his dishes. Growing up near the shores of Lake Michigan and a fairly quick drive to The Windy City, he has undoubtedly been influenced by some of the best food in the world. Glenn studied at Le Cordon Bleu, College of Culinary Arts in Chicago and has also learned from his travels to some of the must food-centric cities in the U.S. Upon his arrival to Omaha in 1994, he quickly began creating his masterful dishes and manned some of the best restaurants in town; including Maxine’s, opening chef at Passport, opening chef at Omaha Prime (Omaha’s first prime chophouse), the ground breaking Bomba Dia restaurant and his namesake Wheeler’s. After 10 years of working at or opening independent restaurants, Glenn decided to take on a the challenge of opening Liberty Tavern located in the Hilton Omaha where he stayed on for 5 years. After his departure from Liberty Tavern he graciously accepted his position at Spencer’s for Steaks and Chops. Since joining the Spencer’s team Chef Wheeler has cemented his reputation as the best Chef in Omaha. He is highly accomplished and has an uncountable number of accolades to prove it. In recent years he has become a true mentor to many young up and coming culinarians who are now aspiring to be some of the greats and are defining what Omaha can do in regards to incredible food. It doesn’t stop there; Glenn always has and will continue to build on his immense knowledge of food and impart wisdom for those lucky enough to accept it. It has been an honor having his passion and ability as the driving force in the Spencer’s kitchen and we are looking forward to see what he brings to the table in the future. Derek Smith has been with Spencer's For Steaks & Chops since the very beginning. For more than 9 years he has been hand-crafting some of Omaha's most flavorful desserts, all from scratch. The passion and expertise that he brings to our team is invaluable when it comes to providing the best guest dining experience in Omaha.